Through the echoes of an acoustic guitar and vocal expressions, Dora Bleu explores intimacy as the place where the capitalist war state replenishes itself. Her work is neither fully compositional nor improvisational. The songs follow an inner sense of narrative time, and are simultaneously tonal and atonal. The guitar is sparse, tense, atmospheric, suggestive of without enacting melodies, sometimes droning or dissonant. The vocals contribute to uneven compositions filled with stark silences and bent notes. The songs intend to violate the concept of genre, to erupt trauma within storytelling, and to evoke vulnerable and dreamlike states. 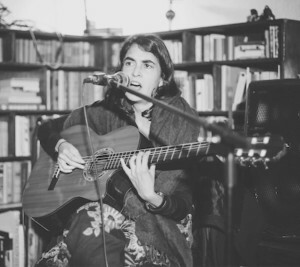 Blue has two sets of recordings in the with Istanbul resident electric oud player Periklis Tsoukalas (Baba Zula, Diamanda Galas); the first appeared on Vienna’s Feathered Coyote label in autumn of 2018. Other past releases include a full length with Tom Carter (Charalambides) and Sam Shalabi (Shalabi Effect, Land of Kush) on via Tequila Sunrise and Fire Museum and another on the Nostress Netlabel with Olga Nosova and Alexei Borisov (Notchnoy Prospekt). Her collaborators for tours, live performances and/or recordings include Alexandre St-Onge, Simon Wickham-Smith, Helena Espvall, Sharrron Kraus, Eric Arn, Brooke Crouser, Anton Nikkila, Salvatore Borrelli, and Lisa Gamble. Prior released solo works featured on labels such as VHF, Camera Obscura, Ikuisuus and others. Dora has toured many times in Eastern and Western Europe and on the North American East coast. Fascism’s Intimacy on Drawing Room Records is Bleu’s most recent release and features American guitarist Marc Ribot. Speaking in tongues is spiritual communication that is both celestial and infernal. Its power is neither wholly human nor otherworldly, and its beautifully positive or damningly negative results lay somewhere in between with the earthly side never having full access. It is not for the faint of heart nor for the unbelieving, but, used appropriately, its captured potency is a most effective form of communication. The music of Dora Bleu is an apex of the creative form of this practice. It is hauntingly intense and complexly grounded for definite, but its gorgeous enraptured vibrancy transfer the aural senses to gloriously new and unseen colors. It is a heavy and shimmering trip most worthy of taking again and again. Mortal forms of communications have yet to create words to best communicate this awesome flight. With Fascism’s Intimacy, Bleu brings this artistic ceremony to the new world to hear and experience. It’s a gorgeous blend of both new and old coupled with songwriting and experimentation. Canonical artists such as Ruth Ann Friedman, Linda Perhacs, and Christina Carter will immediately come to mind along with many guitar greats with a list too long to publish here. In addition, the album heavily features the talented American guitarist Marc Ribot. Required listening for def. 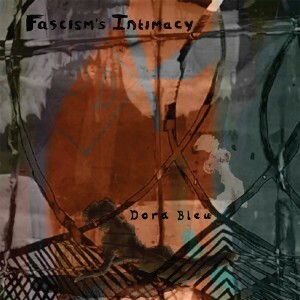 For its 35th release, Drawing Room Records pleasingly presents Fascism’s Intimacy from Dora Bleu. The album is a darkly gorgeous experimental expression of guitar and voice and features the talented Marc Ribot. Mastered by Amy Dragon for Telegraph Mastering and pressed on 180-gram vinyl, the LP comes in a gorgeous full-color sleeve accompanied by a full-color inner-sleeve and 11×22 fold out poster. The artwork is mesmerizingly unforgettable. A digital release is also available.